New music has finally arrived! Dan & the Wildfire will be releasing "The River's Gonna Rise," this year. This latest offering will be a full length album released in four separate pieces. Check out "The River's Gonna Rise, Pt. 1," here! Happy new year, all! We are looking forward to getting this year off to a great start. There are a few things in the works that you all should know about! 1) We're humbled to announce that we'll be kicking off festivities for the Boston Red Sox at their 2018 Baseball Winter Weekend. The event will take place on January 19th at Foxwoods Resort Casino. 2) On February 3rd, we'll be making another NYC trip to play at our favorite NYC venue, Rockwood Music Hall. The show is free, so come see what new music we're stirring up for you, NYC! 4) Finally, in March, we'll be back at Wachusett Recording to continue work on our 3rd studio release. Lots of excitement to look forward to in 2018! Hey all! We are excited to announce that we'll be playing on the famous Yawkey Way at Fenway Park on August 25th, before the Red Sox square off against the Orioles. After our set, Dan & Thom will be singing the American national anthem to kick off the game. The Wildfire crew returns to the studio in September to begin work on our third record. There are many exciting things to come, and we can't wait to share them with you! Lately, it’s easy to look outside your window, turn on the television, or pick up a newspaper and see the very negative aspects of the world we’re living in. We, in Dan & the Wildfire, feel like it’s time for a little positive energy. We’re proud to present you with our brand new single, “Nothing But Love,” a song about our responsibility as human beings to take care of each other and to not only accept, but celebrate our differences. To that end, we are humbled to announce that 100% of the proceeds from this song will be donated to the ACLU. Please take a listen, and if you are so inspired, help us help the ACLU stand up for those who need it, as they do year round, even when no one's listening. 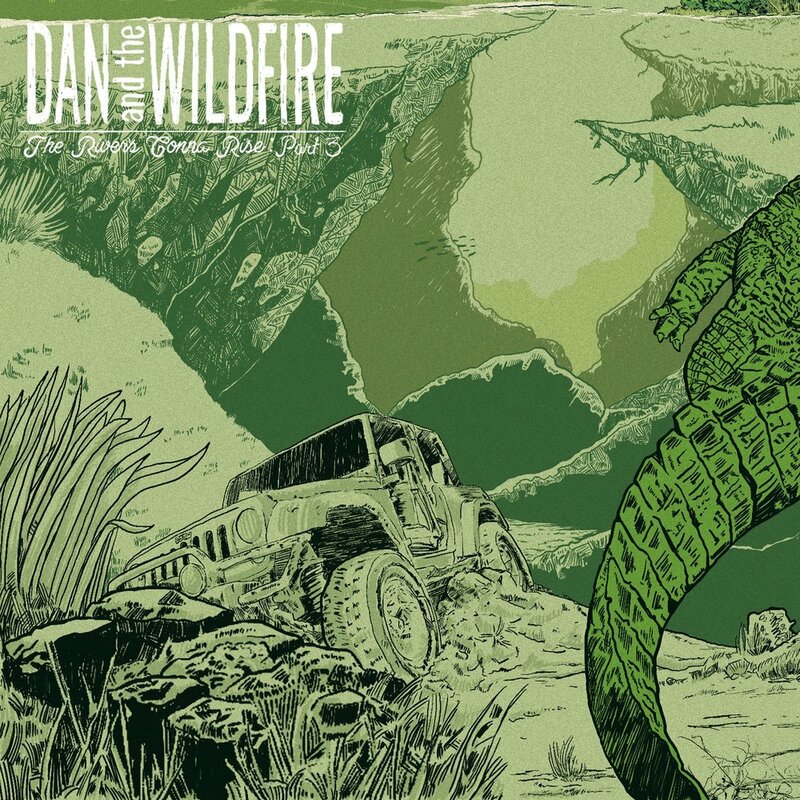 Dan & the Wildfire You can check out the single at the link below. As 2016 comes to a close, we've got a ton of big news to bring to you. Firstly, we are so excited to announce that we have finished recording a brand new single, called "Nothin' but Love," that will be released in early 2017. This is our first release since 2015, and we're beyond pumped to bring it to you. Look for that coming your way very soon. In this extremely awkward picture, we're hard at work in the studio recording our forthcoming single, "Nothin' but Love." We can't wait to share it with you! Secondly, we've got some exciting news on the performance front as well. On January 28th, Dan & Sam will be doing a very special acoustic duo show at Thunder Road Rock n' Roll Bistro opening up for The Band of Heathens! Can't wait to see what 2017 brings! Have a happy and healthy holiday season. We've been busy, that's for sure. We've logged a ton of miles on the truck, and reached a bunch of new fans in new places. We couldn't be more excited about that. Our most exciting news as of late is that we've started the process of making some new music. The band has a renewed energy, and we can't wait to bring you some new sounds. In the mean time, check out the new sights. Here's a collage of Dan & the Wildfire rocking the stage at Ralph's Rock Diner in Worcester. We are beyond excited to announce the new addition to Dan & the Wildfire, Mike Harmon, on the drums! He'll be making his debut on 9/2 at the Middle East Upstairs in Cambridge, MA and helping us usher in a new looking, new sounding era of Dan & the Wildfire. Welcome to the band, Mike! It's been a long time since we've written and updated you on all things Wildfire, but right now that doesn't seem so important. Our hearts broke when we heard about the tragic shooting at the Pulse nightclub in Orlando. There are no words that can make this better, and there are no explanations that can take away the pain being felt by those closest to each of the victims. This senseless, horrific act has sent shockwaves around the world, and now has many asking: "How can we help?" It may be a cliché, but actions certainly speak louder than words, and Dan & the Wildfire is ready to, with your help, take action. Starting today, we'll be donating $5.00 from each "Make Music Great Again" hat sold to the Florida Disaster Fund. It's our way of standing tall in the face of adversity, and lending support to those who need it most. Spring, summer, fall and....winter? No. It is officially political season in New England (and in many other parts of the country) and we are literally throwing our hat in the ring. We, in the Dan & the Wildfire camp, are on a mission to make music great again. We are holding our rallies and campaigning hard to bring back what makes music so special. We want you to get in on this cause, and that's why we've created these signature hats that are now available in our BRAND NEW STORE! So, ladies and gentleman, show some Wildfire pride and let's make music great again. Together. As the first month of 2016 comes to a close, Dan & the Wildfire would like to take some time to reflect on the past year. 2015 was a landmark year for us. "Bull Moose", our second album as a group, was released in March and was met with rave reviews. As a result, we received national coverage from "The Boot," were able to share the stage with country artists Cam and Kacey Musgraves, and were nominated for our second New England Music Award. Looking ahead, the future is bright. We're continuing to support our album "Bull Moose," while also beginning the process of writing new material. We're excited for what 2016 holds. Thank you everyone, for your continued support! September was a busy month for the Wildfire crew. We journeyed down to Washington, DC with a few stops along the way. Thom’s brother John is a tremendous chef so a stop along the way at his new restaurant, Elm City Social in New Haven, CT, was a must. We dined on some fantastic food and rocked their roof deck. Next we played at our good ol’ NYC standby, Rockwood Music Hall. Like always, the room was packed and full of energy. Our good friend Pat, who lended his Saxophone talents on Bull Moose, just happened to be in the Big Apple and joined us onstage for most of the set. We wrapped up the trip at Gypsy Sally’s in DC, opening up for Blair Crimmins & The Hookers. They BRING the old timey swing. It’s certainly starting to feel like fall and we’re taking advantage of it by playing a number of shows around the north east. As always, we’d love to see you at one of our upcoming shows! We also got artsy with some stock footage and a song from "Bull Moose." Check out the video below. Thanks for stopping by the brand new, and very much improved, Danandthewildfire.com. Aside from our makeover, there have been some huge things going on in the world of wildfire. For one thing, we’ve released our record, Bull Moose, which we’d been working on for the better part of a year. The reactions we’ve been getting from fans, friends, and family alike have been so humbling, and the record seems to be gaining steam and popularity every day. It has definitely been a great experience. Secondly, we’ve been reaching a broader audience than ever with our online shows via Concert Window. We’re going to make it a point to schedule at least one of these a month until people lose interest, and we’re going to change up each one with different themes. For instance, we might dress up like pirates, play in togas, or any number of ridiculous things. We want your input, so make sure you drop us a line on Facebook or via e-mail and join the conversation. Finally, we are back to playing live shows! We are always on the hunt for new venues, and new places is to go, so make sure that you tell us where you want us to spread wildfire! Check back often. Be excellent to each other. Dan and the Wildfire is a particularly potent cocktail comprised of 1 part old time mountain folk, 1 part classic rock and roll, and 3 parts bottom shelf bourbon. Mix it up and what you get is a musical experience that burns it's way into your bones and lights up your soul with a crisp, rootsy sound that'll leave you reeling for another taste of that Wildfire. This Boston based band was started by guitarist and singer-songwriter Dan HL in 2011 with trumpeter Thom Brennan and Keyboardist Matt Hines under the auspices of forging a softer, folk sound. Their sound grew beyond the folk boundary when bassist Sam Katz joined the band. To date, Dan and the Wildfire have played all over New England, Washington D.C., out to Chicago and burned down every place in between. Their third studio album 'Bull Moose', released in March of 2015, is the next chapter in the evolution of the folk, rock experience. Their well received second album 'Smoke Signals' is available worldwide and follows their debut album, 'Nothing, Anything, Everything' released under the moniker 'Dan HL' in 2011.